Ardent capitalists make the complicated comprehensible. I missed this book when it came out in hardcover late in 2002, but after seeing it on a number of ''best of'' lists, I snagged a copy when it was reissued in a paperback edition. I'll admit that its title put me off. 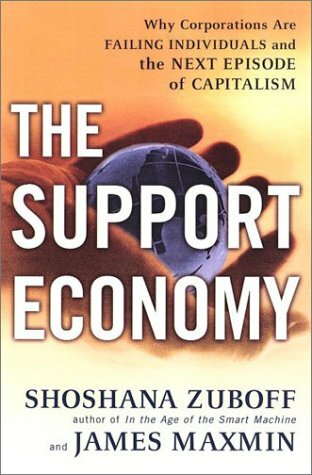 I expected -- due to inclusion of the word ''support'' -- perhaps a neo-Marxist treatise on the value of state ownership of businesses and a renewal of the welfare state. But I couldn't have been more wrong. Zuboff and Maxmin are ardent capitalists with an unshakable faith in the efficacy of the system. Good thing, since they recognized that the system is not working correctly, and that a widening gulf of dissatisfaction and alienation is growing between consumers and the institutions that serve them. There have been other works commenting on this rift; several years back, The Cluetrain Manifesto by Weinberger, Searls and Locke, eloquently and concisely conveyed several important aspects of the changes that have begun as business and government attempt to reconcile these anomalies. But Zuboff and Maxmin, a husband-wife team, paint a much larger picture, presenting a historical perspective and a greater context for these changes that's supported with research and analysis from a variety -- and diversity -- of sources. Zuboff, a professor at Harvard Business School, and Maxmin, an executive and scholar, examine a number of very complicated and seemingly contradictory forces and present a clear and compelling picture of an economy that relies on a consumer culture increasingly frustrated by the growing burden placed upon end users. Therein lies the ''support'' referred to in the title: the pair feels that the opportunity for the economy lies in sustaining and facilitating consumers, and not just selling them whatever products they demand at the cheapest prices. The authors refer to the phenomenon that is driving this change as ''individuation.'' They demonstrate the historical progression whereby people all over the planet have become increasingly insistent that institutions and businesses with whom they deal allow them the customization of their experience based on their own needs and preferences, rather than attempt to treat them as a member of a group. This may seem self-obvious to most of us, but it's actually a fairly recent development in the history of humanity for a number of religious, social and economic reasons, as the authors explain in great detail. As skilled as Zuboff and Maxmin are at making the complicated comprehensible, digesting The Support Economy can be a lengthy and at times challenging process, especially for readers who prefer that insights are presented in smaller portions. But the authors are thinking big -- very big -- as they make a case for nothing less than the refocusing, if not the reinvention, of capitalism, and are compelled to present their persuasive argument based on facts, not intuition or politics. Still, it's clear that they are passionate about their findings, and this book will no doubt influence and inspire others to extend and amplify their philosophies, and maybe even implement them.